Montreal’s Ensemble Caprice has appeared frequently on the SFEMS concert series over the past 20 years, each time looking at historical music with fresh eyes and performing it with a different twist, from Telemann and the Gypsies to the Latin American Baroque, always delighting our audience with their passion, virtuosity, and wit. 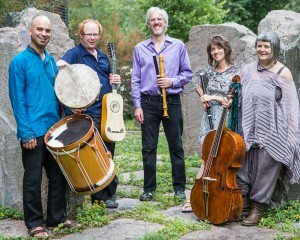 The ensemble, co-directed by flutists Matthias Maute and Sophie Larivière, and also including cellist Susan Napper, guitarist David Jacques, and percussionist Ziya Tabassian, returns the weekend of April 12–14 for a concert that explores the theme of Love in early music. Their program weaves together eight short stories with two centuries of great music from five countries, by composers including Bach, Falconiero, Schmelzer, and Vivaldi, to demonstrate the drama, tenderness, joy, humor, and melancholy of the music that make us all love Baroque. Matthias Maute gives us a preview. Music tells stories. What a simple statement—but how far-reaching are the consequences generated by the intrusion of fiction into music! The music of the 17th and 18th century was often conceived with a narrative or a particular situation in mind: When J.H.Schmelzer in his Serenata con altre arie leads us through the whole cycle of carnival, including the dances, the comedia dell arte of arlecchino, and then subsequently the regrettable end of the festivities on Ash Wednesday garnished with a deathbell and a repeated lamento, we witness a whole story unfolding within a very condensed time frame. However, interestingly enough during the 17th and 18th century people attributed to music the power to bring the notion of eternity into their daily life. The chaconne became the synonym for eternity and a symbol for music which reaches out to higher dimensions. The fact that the bass pattern is repeated over and over again, turning around like a spinning wheel has made it possible to associate a fairly simple (however very powerful!) harmonic progression with a dimension of time which goes beyond our human measurements. Bach’s famous Chaconne BWV 1004 comes with an aura of death and vanity : supposedly he wrote it as instrumental lament for his first wife Maria Barbara, who tragically passed away while Bach was traveling. Purcell’s “Two in one upon a ground” presses on into unknown territory of our experience of time: whereas the repeated bass line refers to eternity, the canon of the two recorders integrates both past and future into one line brought to life by two different performers. While player 1 shows the future (we already know what the other player will perform), player 2 shadows the past of his colleague who is always a step or two ahead in time. From there it is only a small step to the depiction of heaven and hell (Ciacona di Paradiso, et dell inferno), the anxiety of a young girl who does not want to enter a convent (Sonata sopra la Monica), Falconiero’s battle between Satan and Barabas or Vivaldi’s breathtaking excursions into the wild world of madness (La Follia). Despite the variety of different stories being told, all these pieces share one feature: repeated patterns open the ear to a perception of time which is nourished by the mystery of life and death. Performances take place 8:00 p.m., Friday, April 12, at First Presbyterian Church, 1140 Cowper Street at Lincoln, in Palo Alto; 7:30 p.m. Saturday, April 13, at St. Mark’s Episcopal Church, 2300 Bancroft Way, in Berkeley; and 4:00 p.m. Sunday, April 14, at St. Mark’s Lutheran Church, 1111 O’Farrell at Gough, in San Francisco. Tickets are available online, through the SFEMS box office at 510-528-1725, or at the door 45 minutes before each performance.